10 June 2015 Calcutta photo from Shutterstock.com. The author presents a balanced, if occasionally slow-paced, portrait of his birthplace, detailing his travels and memories of Calcutta over a two-year period. Everything you’ve ever heard about Calcutta (modern-day ‘Kolkata’) is, in a way, true. The chaotic beauty, poverty and squalor, incredible food, the civic pride, omnipresent vestige of the British empire, immeasurably rich art and culture, it’s all there and then some. More than anything, however, Calcutta is one of those rare cities that ‘stays’ with you long after your visit. Love or hate it (for the outsider, there is seldom an in-between), Calcutta can’t help but imprint itself on your psyche, assault your senses, and force you to question your previous assumptions about what a city is capable of, in both darkness and light. For both tourist and local alike (or so I imagine), it is impossible to be neutral about Calcutta. Similarly, I imagine it would be difficult for most readers to be neutral about Amit Chaudhuri’s fascinating memoir Calcutta: Two Years In The City, recently released in paperback. Spanning both the history of the author’s connection to Kolkata, and the recent history of the city, the natural inclination is to compare Chaudhuri’s memoir to the Trinidadian author V.S. Naipaul’s India trilogy (including An Area of Darkness, India: A Wounded Civilization, and India: A Million Mutinies Now). Although Chaudhuri’s deft prose is comparable to Naipaul’s, Chaudhuri is less polarizing, while at the same time sharing Naipaul’s occasional prickliness, and commitment to maintaining his self-awareness as an ‘insider/outsider’ of sorts. At the same time, Chaudhuri makes Calcutta seem like a fascinating, if challenging, destination for the uninitiated traveler, while it's not hard to imagine that Naipaul’s causticity continues to turn many travelers off of India entirely. 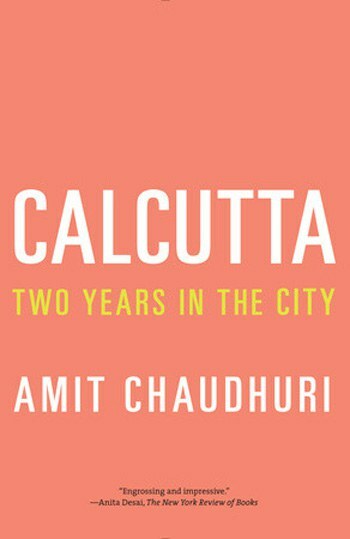 This is not to suggest that Chaudhuri’s vision of Calcutta is overly romantic; quite the contrary, as the author explores poverty, religious prejudice, governmental incompetence, and the city’s slow decline in often-discomforting depth. The author presents a balanced, occasionally slow-paced, portrait of his birthplace, detailing his travels in, and memories of, Calcutta over a two-year period. On the food; Calcutta is one of Asia’s great culinary destinations, and the author seems to take great delight in writing about this rich and complex tradition. "Bengalis talk constantly about food to express an irrational joie de vivre in the midst of a jaded present; and they speak of their digestion -- especially a mysterious complaint called "gas," or gash -- to register melancholy, a persistent dissatisfaction with life." (p. 136) What most North Americans (and Brits, for that matter) consider “Indian food” belongs to the Punjabi tradition from the northwest of India; Bengali cuisine, with its heavy reliance on seafood, and overall more floral taste and texture, is an entirely different world, and Chaudhuri captures that world well here. As it might feel impossible to read some of Hemingway's works without getting hungry, reading Calcutta made me pine for a Bengali dinner, while at the same time enhancing my appreciation of the range and diversity of the cuisine on offer in one of my favourite cities. Despite the renovation of recent years, with glitzy shopping malls and multiplexes replacing the crumbling colonial infrastructure of yore, Calcutta’s problems are legion, its detractors many, and the ongoing “brain drain”—the educated classes’ flight to the comparatively greener pastures of America, Europe, Delhi, and Mumbai—continues to threaten the city’s artistic and economic future. Calcuttans are nothing if not resilient, however, and anyone despairing over the city’s future need only look to a 21-year old Bengali friend of mine who once cringed when I used the city’s colonial pronunciation (‘Calcutta’) in conversation. (It's interesting that the author chose to do the same throughout Calcutta.) “No, it’s Kolkata,” she reprimanded me. “Calcutta is in the past.” The city’s destiny is ultimately in the hands of this younger generation of Kolkatans who, unlike many of their elders, dare to dream of an incrementally better future for their city, rather than cling to the grand revolutionary narratives of the past. With Calcutta, the author has compiled a vivid, sensitive, and perceptive literary portrait of the city. This rumbling, enraging, paralyzing, energizing, and overwhelming behemoth of a city is immensely difficult to capture given the limits of language, but Chaudhuri is worthy of serious recognition and appreciation for his accomplishment with Calcutta.